I have really enjoyed wearing the Showers Pass Apex Tech T-Shirt so far. It is fast becoming one of my favorites for bike riding and is a great hiking shirt as well. 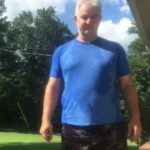 It has been very humid this summer and I was able to test the wicking ability of the shirt to the max. To read all my thoughts so far please click here.